When I went to pick up the bike, the first impression was a rather happy ‘Not bad’. The bike may not look too extravagant but its clean cuts, rugged look aptly presents what Royal Enfield projected it to be- Adding the ‘fun and accessible’ back to adventure biking. We finally started at 6 pm, riding 2 Himalayan and 2 RE Classic 350, and took the Dasna toll through NH24. The traffic all the way through Ghaziabad was rather heavy, all thanks to the long weekend approaching. Thankfully, the bike wasn’t a glitch anywhere throughout, be it the smooth pick up, fantastic suspension and (Especially) the seat height. Undeterred, we kept on at a speed of 120 km/hr until we reached Rampur. It was time for a well-deserved dinner. It was once we reached Haldwani that the lanes got better and the views started to sober up to the lush green we were travelling for. Around 1 am that night, we were finally in the stone cold arms of Nainital at Mall road. Narrow lanes, houses all lit up like a whole lot of matchboxes twinkling right above the Naini Lake, all without a sound. What a view! Tired to the core, we took a room in the nearby hotel and crashed like there was no tomorrow. Next day, after breakfast got us feeling like well rested humans again, we enjoyed the scene around before moving to Mukteshwar. The valley is nothing short of wonders, and the views of the crystal clear sky with its marshmallowy clouds against the backdrop of Himalayan range is simply awe inspiring. The time by which we planned to reach Kausani didn’t give us much bandwidth, and sadly, we couldn’t visit the popular spot Chauli ki Jali. But Kausani was the highlight of the trip for me, for I had heard so much about it from friends and around. So off we went to the big stretch of our journey, Mukteshwar to Kausani. Here, I would like to take a moment to commend on the Himalayan here. 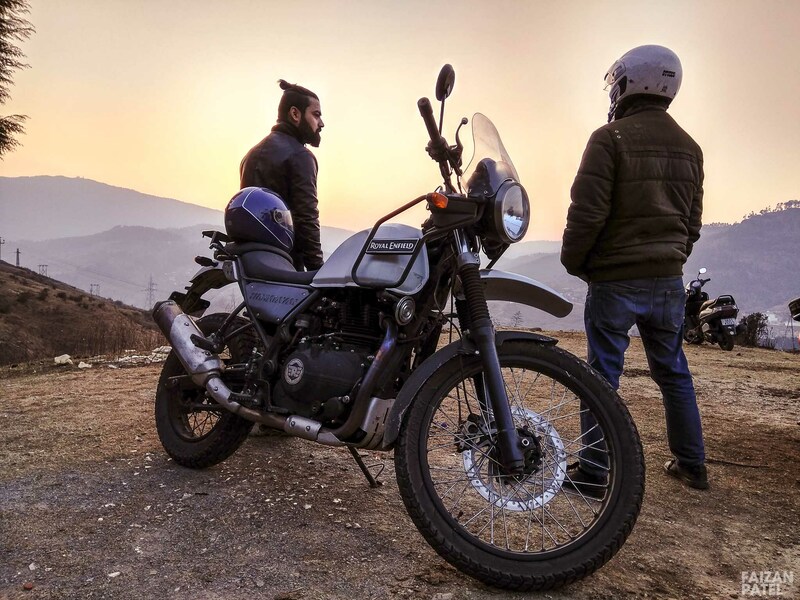 Rusty roads, hilly curves, the bike is ACTUALLY tailor-made for those last minute mountain riding decisions where you enjoy the simple fun of being on the roads and as a bonus, don’t feel a single jerk while at it. We were in time for an early dinner at Kausani, and the simple, homemade food at the homestay was just the perfect thing we were looking for. Next day, fully charged with a good night’s sleep, we started early and went to couple of popular spots, including View Point. Another place I really liked was the majestic view of Trishul Peak in the Himalayan range. When I first shifted to Delhi, I remember one of the things I got most excited about was the proximity to the Himalayas. I reveled in the very idea of taking a trip to the mountains every second weekend. Of course, you plan and life laughs. The ride from Kausani to Ranikhet was undoubtedly the best part of the whole journey. The scenic views, the unadulterated green, the houses that looked like homes, the little girls with their goats giggling at us when I asked for a photo, everything was magical in its simplicity. What really helped was that the bike was a breeze to maintain, even in the remotest of location, or the curviest of curves. Some might complain it’s a little too bare, but I disagree, and frankly, that’s to each their own. From my four-day long experience, I loved the design’s emphasis on a utiliatarian approach and making it all about accessibility. Ranikhet, the evergreen cantonment area of the Kumaon region, is a great place to chill out for the weekend, especially with family. That’s one place I certainly bookmarked for another weekend. On our way back to Delhi, we took the Moradabad by-pass route. Not a wonderful idea, in retrospect. There are no street lights on the whole route, not to forget that the truck drivers there drive rash. I’d suggest one avoids this route at night. After a long time, this was a road trip, and road trip done right. The friends, the mountains, the smooth, glitch free journey, all went rather well. Coming to the bike, I think the Indian market has found its meeting point between ADV bikes and the regular ones that can’t deliver on dirt roads. While the view mirror could be sturdier, this mid-level weight category bike is perfect ride for one adventure to the other, and all the in-betweens too. For a fully ‘Make in India’ bike, this one delivers.